Description: A slender anemone with an elongated column divided into scapus and capitulum, with a parapet and fosse; in full extension the parapet may smooth away (see photo.). Acontia present, emitted from small pores on column which are visible as dark spots. Diameter of base up to 15mm, height to 60mm. Colour fairly consistent, translucent orange with a greenish tinge., especially on disc: a buff variety is also recorded. Reproduces by basal lacerations. When disturbed a fluffy expanded Diadumene will contract in a characteristic, jerky fashion. Habitat: Mostly on the shore, in pools, under stones, commonly amongst mussels, or in shallow sublittoral down to about 20m. Often found in brackish water creeks, in estuaries and harbours, attached to piers or pontoons, etc. Distribution: Occurs on all coasts of the British Isles but rather local; also recorded in other parts of western Europe, possibly more widespread. Similar Species: Small, orange specimens of Metridium senile may appear to be superficially similar but in these the parapet is permanent and contraction relatively smooth. 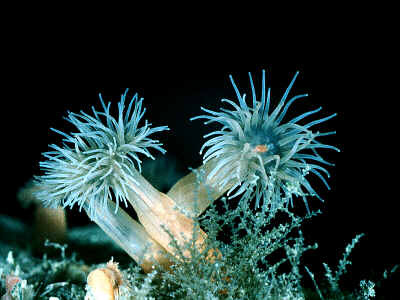 Most small Metridium have a white band on each tentacle. Once Diadumene has been recognised future identification will pose no problems. Elongate column with parapet and fosse that may smooth away in full extension. Picton, B.E. & Morrow, C.C. (2016). Diadumene cincta Stephenson, 1925. [In] Encyclopedia of Marine Life of Britain and Ireland.